Genika Astro is an image acquisition software dedicated to astronomical imaging. Genika Astro is a high performance and feature rich image acquisition software dedicated to astronomical applications. Genika Astro is used by professional observatories in Europe and USA, and hundreds of backyard astronomers. 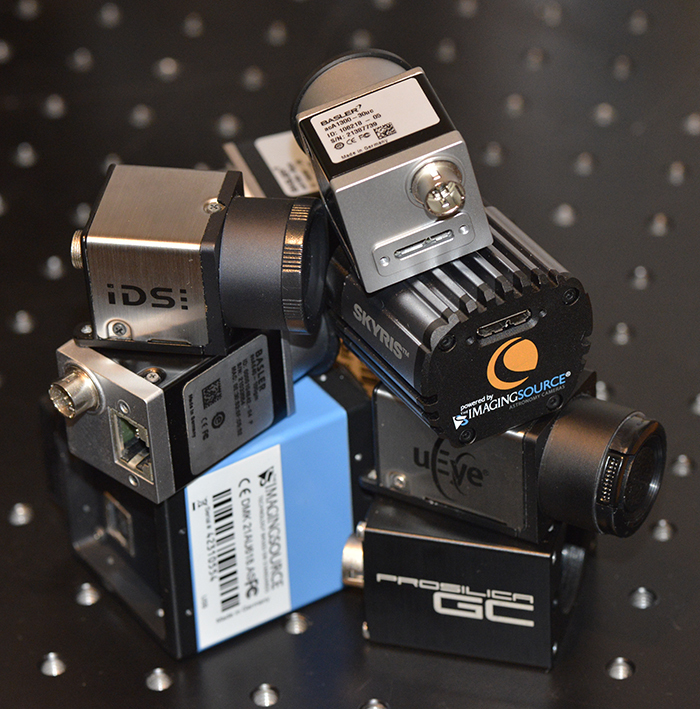 The wide range of camera and sensors supported matches all needs, including CCD, CMOS, sCMOS, EMCCD and NIR sensors from AVT, Basler, IDS, TIS, Pointgrey, QHY, ZWO and Andor products. Airylab has passed an agreement with Raptor Photonics and Genika Astro support the full camera line, including the NIR Ninox camera. Genika Astro offers the best performance for direct image-to-disk recording on the market. It can sustains more than 400MB/s throughput for a long period of time, the only limit being the disk capacity. It uses the advanced data management of its sister application Genika Trigger to miminize the frame loss, or even completly eliminate it by using the FIFO dynamic buffering and two leaky bucket algorythms. Stringent timing requirement is covered either by the use of a GPS resynchronization for a precision better than 10ms, or using the optional UTC Timebox that controls the camera shutter directly for a sub millisecond precision unique on the market, even with a laptop anywhere in the world. 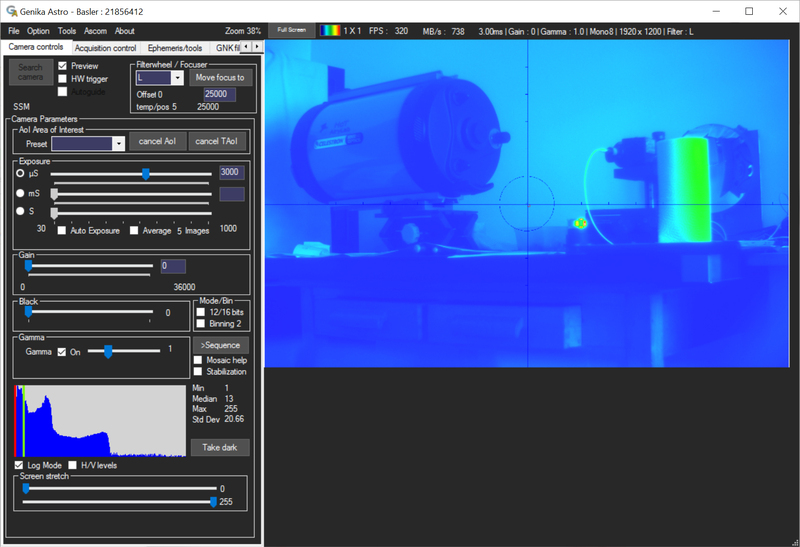 We are able to develop custom features or camera support for professional abservatories, including on the fly image analysis for external appliance control such as a spectrometer or another set of cameras. And last but not least, Genika Astro user interface has been kept simple for a fast handling on the field, even without a training. 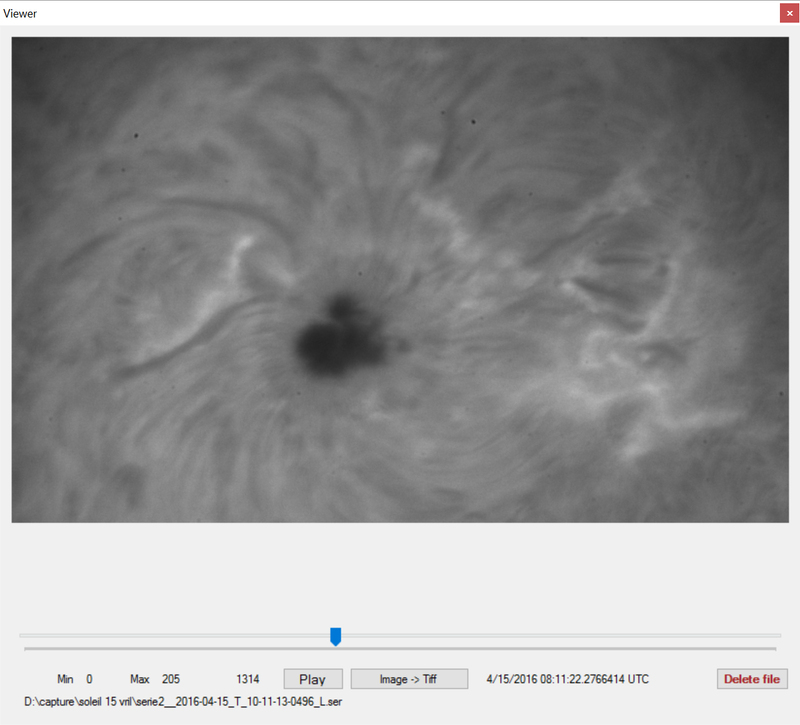 - Support for monochrome Andor SDK 3 (Neo/Zyla), Basler (all but camera link), IDS (All), AVT Prosilica (all), Celestron/The Imaging Source, Pointgrey (all), QHY (USB3), ZWO ASI (USB3) and Raptor Photonics (Camlink with EPIX framgrabber). Supports color Basler, QHY, ZWO and TIS/Celestron. - Any pixel format available on the camera (8/10/11/12/14/16 bits). - Shutter control from µs to the maximum exposure time supported by the camera. - Mouse defined Area of Interest or quick preset setting. - On the fly dark frame substraction. - On the fly hot pixels correction. - Shutter commanded by external electrical trigger. - Save/load camera parameters (Basler/IDS/AVT), auto configuration saving along with an image acquisition. - Acquisition parameters reminder in the status bar. - Adjustable zoom from 25 to 200%, free with 5% increments in DirectX mode. Full screen mode. Auto fit to screen zoom. - Programmable display and histogram refresh. - On the fly debayer of color images for display. Can be disabled. - DirectX rendering on GPU. - Video stream preview, false colors mode with spectrum ramp, negative and log modes. - Live histogram with Min, Max, Median, and Std Dev and Log mode. Horizontal/verticles levels display on the image from a selectable position. - Selectable low/high visualization thresholds. - Selectable analysis AoI (histogram, focusing...). - Reticule with programmable circle and ticks in pixel or ArcSec. - Low CPU utilization, advanced programming (sequential writing, heavy multithreading, double leacky bucket, DirectX rendering...). - SER, GNK, Tangra ADV, TiFF and AVI file format for direct acquisition. - Direct to disk or FIFO capture modes. 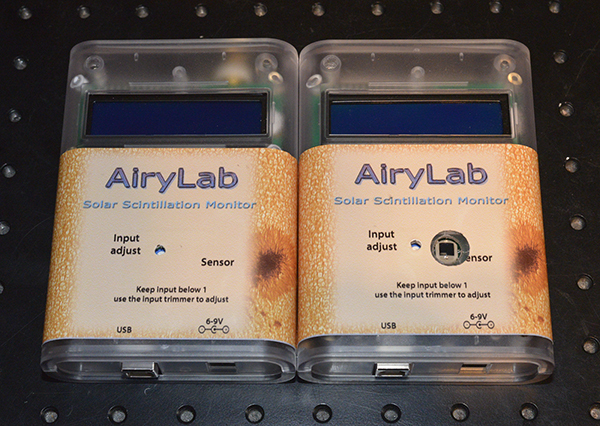 - Auto acquisition mode when used with a Solar Scintillation Monitor. - SER color RAW format support in 8 and 12 bits modes. - User defined file Prefix. - Filter suffix, Flat and Offset file tags. - File name timestamping, SER timestamping support. - Txt file associated to each capture with acquisition parameters, ephemeris and seeing data (with SSM). - Winjupos mid acquisition format in .txt file (hh :mn.d). - Free run or frame/time limited captures. - Fully featured repeatable multiline sequencer with focuser and filterwheel automatic control. - Automatic focus correction at filter change during a sequence. - On the fly image stabilization by center of gravity. - Integrated SER file manager with preview and batch conversion to AVI, Tiff or FITS. 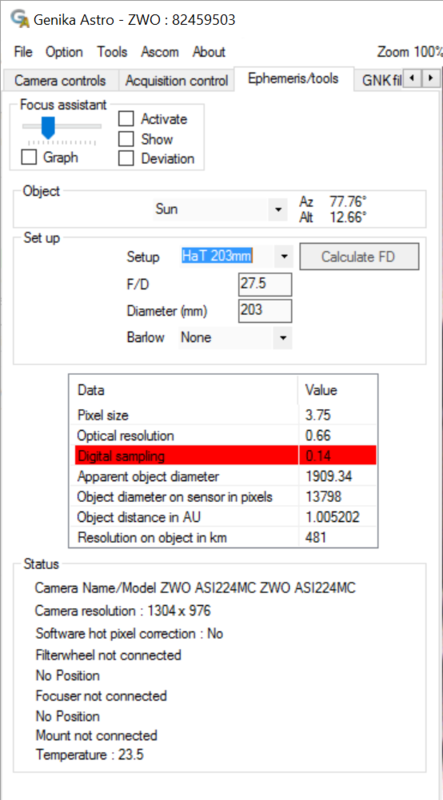 - Batch SER conversion to FITS (single, 3D Cube and multi images) with DATE-OBS. - SER file timestamp correction to GPS timing (GPS required). - Automatic real F/D detection. - Autoguiding through ASCOM pulse mode using center of gravity or phase correlation on object surface. - Planets, Moon and Sun ephemerides without Internet access. Real time Alt/Az display. - Sampling calculator and sampling advice. - PSF analysis tools including entropy, FFTD and FFTI with frequency filtering, and FWHM. - Customizable filter/barlow/AoI list. List editors included. 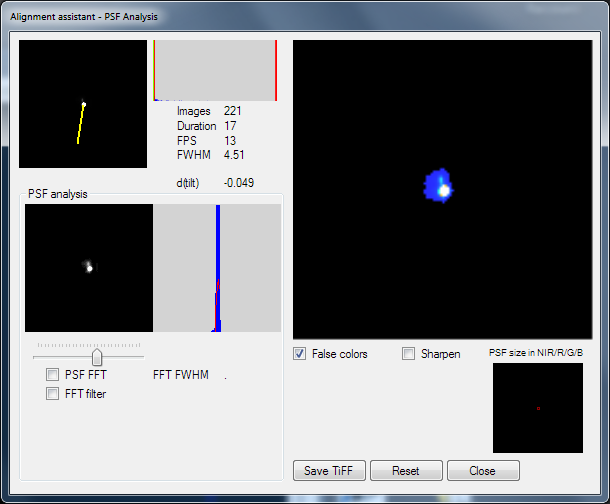 - Focus wizard with micro-contrast and image slopes analysis and visualization and noise analysis. - Automatic autofocus with an ASCOM absolute focuser. - Automatic focus adjustment on filter change (requires ASCOM focuser and filterwheel). - ASCOM filter wheel and focuser control. - Online automatic software updates. - High DPI aware application for Windows 8 and 10. - Complete user manual in English and French. - Visual Studio 2015 C# templates for DLL called on display event or at image reception event. - ASCOM plateform for mount, filter wheel and focuser control. Genika Astro Std can support all cameras but Andor and Raptor. The license is bound to your camera(s) (up to 3) so you can use Genika on several PC as long as you use the same camera(s). When ordering through Paypal, please provide your email address along with your cameras serial numbers. A license file will be generated and sent to you. That opens all further updates as well. For Genika Astro Pro with Andor and Raptor camera support, please contact us. You can try the application without license to check if it does support your camera. The record feature and the SER toolbox won't be available though. 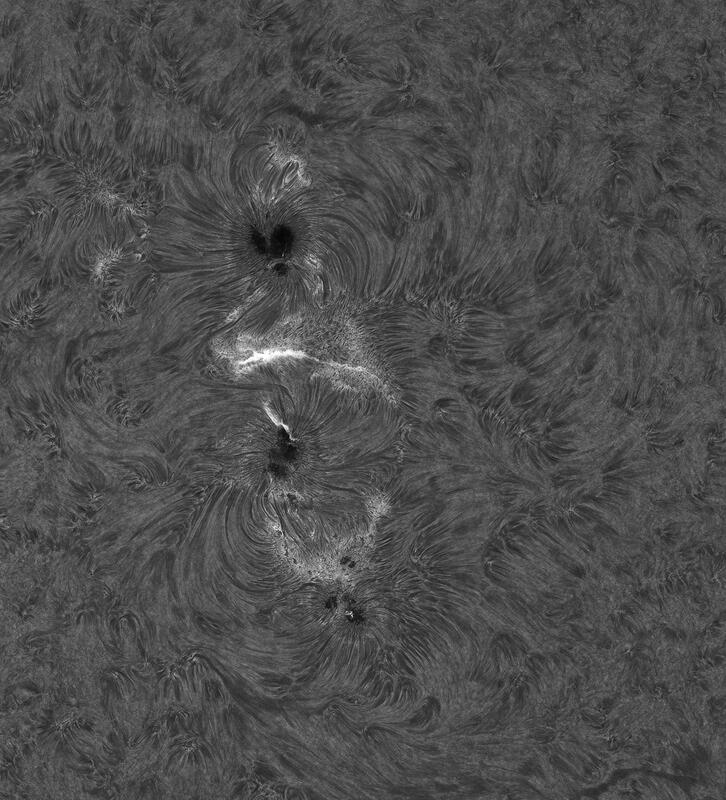 Basler 1920-155um HA image shot with Genika Astro and Airylab’s HaT 203mm high resolution Ha telescope. Simon De Visscher. Jocelyn Sérot releases the first public plugin for Genika. Live Speckles calculates in real time the power spectrum and the auto correlation of a double star. Release 2.13.4.0 now supports QHY cameras, including color sensors. Release 2.13.2.0 now offer the possibility to make our own DLL for image processing in Genika. You can develop an instanciated DLL with its own windows, threads, methods and members. The DLL entry methods are called by Genika. Two VS2015 C# projets examples are included, from that you can use any library and language. We introduce in release 2.13 new focusing features. 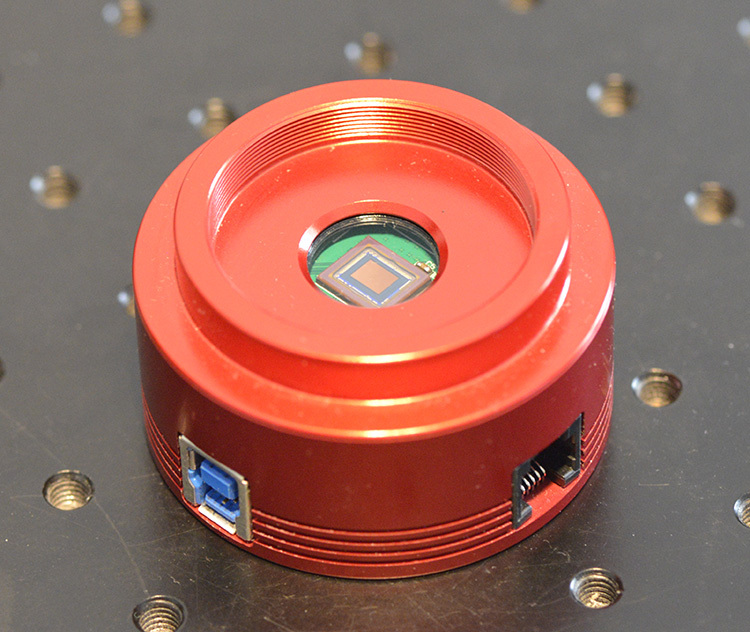 A new scoring for manual focusing, and a unique autofocus when an ASCOM absolute focuser is available. Release 2.12 makes Genika Astro application aware for high DPI screen. Genika won't appears blurry anymore on Windows 8, 8.1 and 10 on a large high DPI screen. Other enhancements and perfomance gains, espacially on the FIFO buffer management. A pause button is back in freerun mode. Histogram and levels have been modified for color cameras, the histogram now shows all three layers separatly when the debayer is active. You may generate a contact mail from Genika when you have a bug or an issue. Genika will automatically attach information files to the mail. Genika user interface evolves for more comfort ! Release 2.10 brings a better color camera management, PointGrey GigE and ZWO ASI USB3 camera support. It is now possible to use the excellent IMX224 sensor within Genika. Pointgrey is back in Genika Astro. 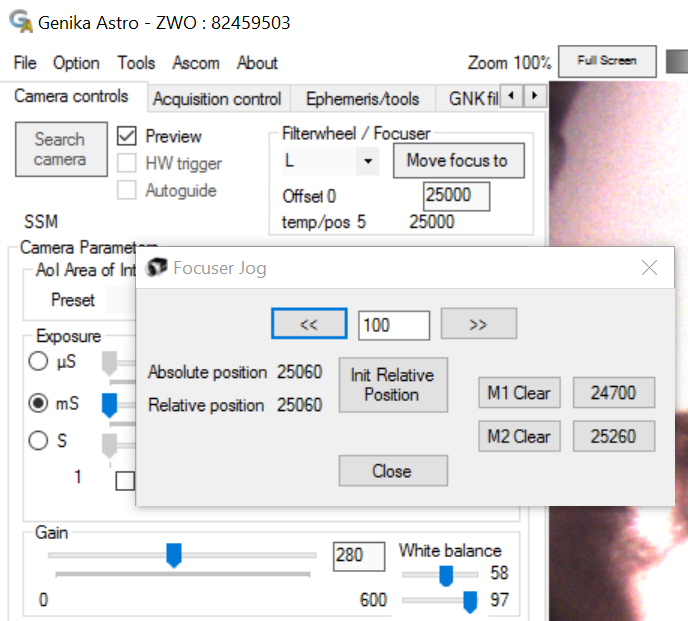 PointGrey support was a strong request from US and UK users who wanted to be able to use Genika and its SSM connection for the automatic acquisition mode with their PGR camera. 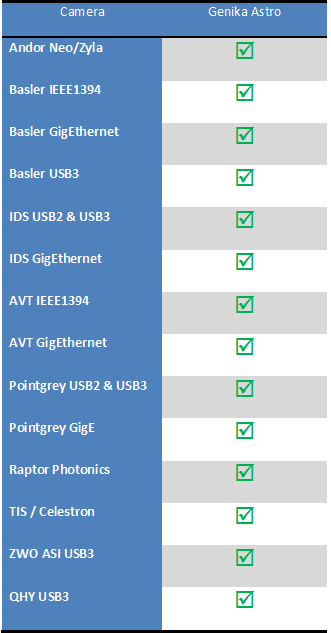 Genika Astro supports monochrome USB2/USB3 and GigE interfaces. This release also adds a powerful phase correlation guiding mode to guide on solar or lunar features. 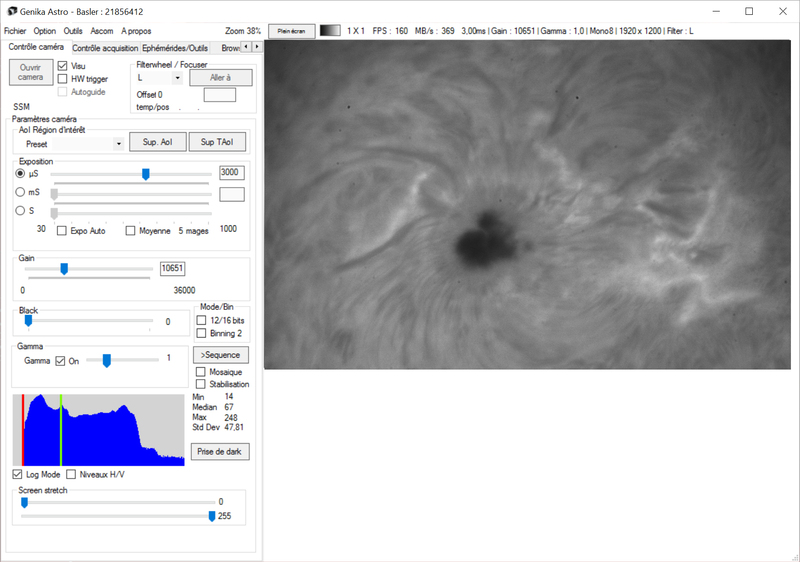 No need for a separate guider anymore in solar imaging anymore. 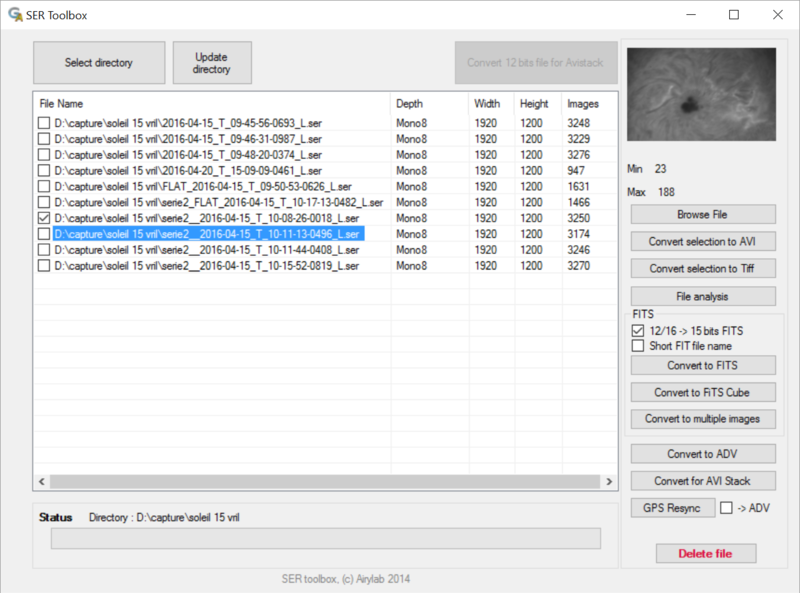 Now Genika can track your planet and automatically acquire the best images when used with a Solar Scintillation Monitor appliance. Genika 2.8 also brings amongst other features and improvments a new FIFO buffer mode when it is critical to not lose a single frame. All FITS export have been revamped to comply with cFITSIO, including DATE-OBS field. FITS supported formats are Single FITS, 3D Cube FITS and multi image FITS. All this new format target astronomical applications such as mutual phenomenons on Jupiter moons and asteroides transits. It is now possible to reclock precisely SER, FITS and ADV files with a precision better than 10ms. An agreement between Raptor Photonics and Airylab will bring the support of all Raptor cameras in Genika softwares along this year. 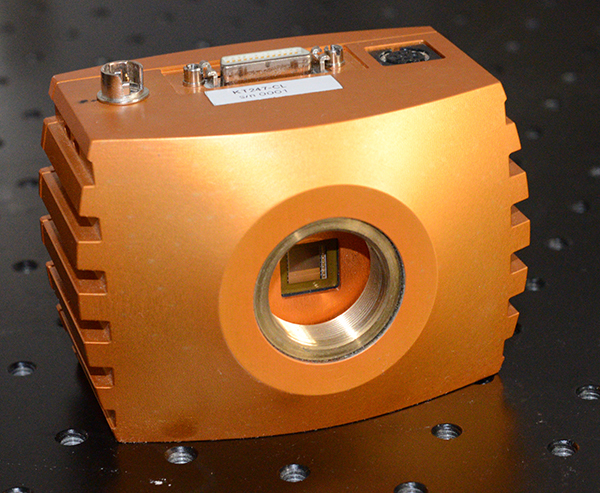 We start with the Kite EM-CCD right away. This version also brings a user selectable screen stretch feature for >8 bits modes, and two new rendering modes : inversed and log.